in the kitchen and I was able to put together Curried Sweet Potatoes in Vegetable Stir-fry in about 30 minutes and trust me it was super delicious and filling. 1 1/2 cup of Chopped Vegetables: cabbage, Tomatoes, Carrots, Green Beans, Green Pepper, Red Pepper and Onions. Peel, wash and chop potatoes into desired shape/size. Put in a pot of boiling water, add 1/2 tablespoon of curry powder, a pinch of salt and allow to cook until tender. Add oil to pan a non-stick pan, allow to heat and also add a pinch of salt. Add chopped vegetables, thyme, seasoning to taste and allow for 7 minutes . Strain water from potatoes and add potatoes to stir-fry. Mixed together and allow to simmer for 4-5 minutes. Hi dear, great recipe you have here. Please can I substitute with yam if I don't have sweet potatoes at hand? Yes dear, you can. 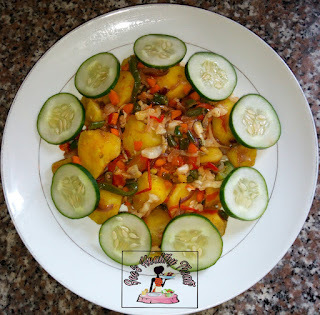 Chop the yam into small cubes so you can get the best from it. Please do let's us know your feedback when you do. Thanks for reading.